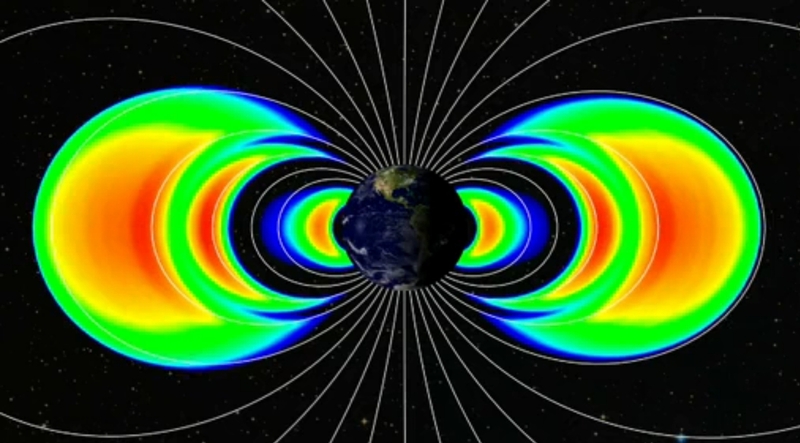 Visualization using actual data from the Relativistic Electron-Proton Telescopes (REPT) on NASA’s Van Allen Probes shows three radiation belts, in orange (Credits: NASA). NASA’s Radiation Belt Storm Probes (RBSP) were supposed to make new discoveries about Earth’s van Allen radiation belts. But no one really expected the discoveries to be this big. REPT investigators published their findings in the journal Science on February 28, but this is just the first step in what will likely develop into a new model of the radiation belts. Physicists had developed explanations for the relatively radiation-free slot between two radiation belts, but the geometry introduced by a third belt no longer fits that model. The Radiation Belts perform a critical function in corralling incoming energetic particles thrown off by the Sun so that they don’t bombard Earth with extra radiation. Understanding the belts can help us predict vulnerabilities and protect spacecraft that regular traverse the belts from radiation-induced failures.